Mumbai: Prime Minister Narendra Modi stressed on reducing dependence on other countries for getting medical equipment so as to make treatment affordable for people. “Seventy per cent of medical equipment used are imported from foreign nations. This situation has to change because it makes the treatment very costly,” he said after launching a book to mark Tata Memorial Centre’s 75 years of social service. He was addressing the event held in Mumbai through video conferencing from New Delhi. The aim of the National Health Policy is to ensure affordable health care, he said. “We have come out with a National Health Policy. With this, our aim is to ensure affordable health care for all,” the prime minister said. He said the government was aiming at providing the best medical care to all sections of the people and, as part of it, new AIIMS and medical colleges would be set up across the country. “We are coming up with new AIIMS and medical colleges across the country. We want every citizen to have access to best medical treatment,” Modi said. “I congratulate Tata (Memorial) hospital on their platinum jubilee. I am happy to release this book,” Modi said after releasing the book titled ‘Indelible footprints on the sands of time’. The book traces the journey of the hospital, identifying and defining its growth and development. “After 75 years, this institute is known for education, human resource development and research. Very few hospitals in India have done so much for human ailment,” said the prime minister. Stating that cancer was one of the biggest challenges of our times, he said it was vital to create a common platform where patients get affordable treatment. “Cancer is no less than an ‘agni pariksha’ for anyone,” he said. The contribution of Tata Memorial Hospital towards its cure is laudable, he said. 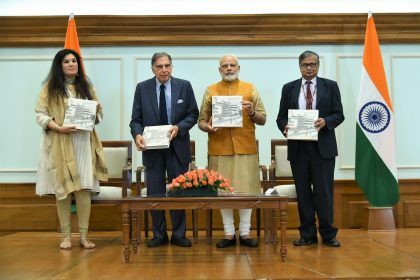 “I congratulate Ratan Tata and Tata Memorial Hospital for serving the poor,” Modi said.